Georgian Newcastle light baluster wine glasses are without doubt the pinnacle of elegance in Georgian drinking glasses. 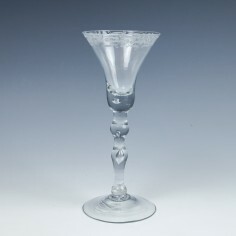 The glass - or metal if you prefer - has a propensity to be brighter than other English lead metal drinking glasses of the same period. Some academics have argued that they may have been produced on the continent rather than in Newcastle itself. Based on the overwhelming weight of evidence such as glasses engraved for Dutch dignitaries and royalty who would only want home produced glass it seems highly unlikely they they were not produced in Amsterdam, Antwerp, Liege and Namur to name but a few and in lead glass. The stems themselves feature series of complex knopping structures, many with both air tears and beads that enhance yet further the brilliance of the glass. Composite stems, part air-twist and part plain or opaque twist are also found. The bowls are typically larger than other drinking glasses of the same period with predominantly bell and round funnel shapes. The structure alone would rank them amongst the greatest drinking glasses ever made, however they are also almost invariably Dutch engraved, and the engraving is of a quality that has yet to be surpassed. Armorial, commemorative and decoratively engraved Newcastle Light Balusters are an essential part of any collection and are most highly prized when signed by a known engraver. The current view is that Light Balusters were produced both here and on the continent in the Low Countries and in Thuringia (central Germany). The quality of metal and form of the best Light Balusters suggest an English origin - whether this might have been Newcastle or London or Bristol or Stourbridge is still a matter of conjecture.